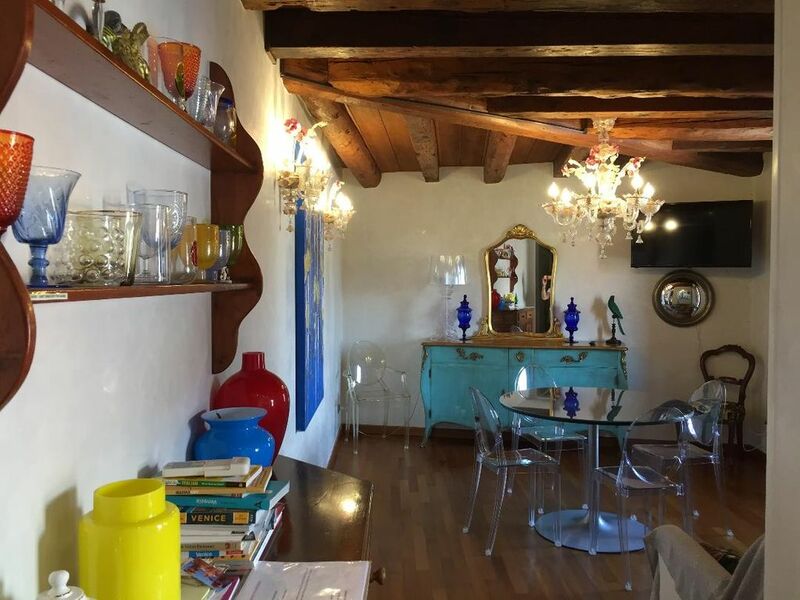 This elegant apartment is located in the historic center of Venice, next to the prestigious school of San Rocco (Tintoretto paintings collection) and the church of the Frari (Titian's Assumption). Overlooking in Campazzo Tolentini, opposite the university of architecture and homonym church, it is convenient for walking to the main tourist sites. The apartamentis easily reachable on foot from Piazzale Roma (100m) and railway station (300mt) is convenient to sightseeing and excursions to the islands of the lagoon. The apartment is very sunny and bright, with stunning views from the windows of the canal and field. Renovated in 2016 comprises entrance hall, separate kitchen with dishwasher, oven, refrigerator, small appliances. The sleeping area includes a double room with a double bed and a bathroom with shower. For customers who stay more than a week, there is a washing machine. Check in from 15:00 Check out at 11:00 The check in is free until 8 PM, after that time you have to give 20 euros. After 10 PM the cost is 30 euros. CHECK- IN CLOSES AT MIDNIGHT! Great stay in Venice. Chose this apartment for easy access to bus terminal. We got so much more... Luigi was quick in response to any inquiry, both before and during stay. Apartment was clean, stylish (as seen in pictures) and comfortable for our family (which included school aged children). As others mentioned, several flights of stairs, but this made for a great view. We liked the location, as we were close to Grand Canal without being in the bustle. We loved how close this was to the bus and train stations. It was very easy to get to. The apartment was sparkling clean and met all of our needs. Wonderful apartment, perfect location, gracious hosts. It is very near Ferrovia and Piazzale Roma. If you are love to wonder but are prone to getting lost this is a definite plus at it means you can always find "home". Plus vaporettos to everywhere very nearby. The hosts were very gracious, the apartment is lovely and comfortable. The only recommendation I have is that they explain that it is a walkup on the website, as older or less fit people might find that a challenge. Also important ... downstairs there are two great places open from breakfast through late night, great for coffee, snacks, salads, dinner, a glass of wine... and bed us just up the stairs! A very special place in a Venice neighborhood. A very good place with all the amenities and a friendly person who greeted us at the right time and even carried our bags up the stairs. We had good communication with the hosts, and they gave very good directions. The apartment has great views of the active plaza and canal below. It is pretty quiet inside the apartment despite the active area. There are good restaurants and stores nearby. Very close to train and bus station, an easy walk. Everything worked as it should. There is ice and soap and many utensils, etc. Interesting décor throughout. The window opens onto the plaza. The apartment is good sized, only the bathroom feels cramped. It seems very secure. On the negative side, it is on the 4th floor and no elevator. There are cracked tiles on the 3rd floor landing, on which I tripped. Finally, and most importantly, there are 4 levels of floor in the apartment. You need to be alert as you move from room to room or you will stub your toe or trip. It happened to us three times. I would stay here again and recommend it to family members --- but be alert as you move around the apartment. It's a great place from which to experience Venice. Dear Charles, I want to clarify that the apartment is on the third floor, no fourth! Thank you! Great location with great accomodations. My wife and I stayed with our two adult children. There was a double bed and two twin beds. The location is very near the bus station and the train station. This is helpful in Venice as you either walk or ride a boat. Two air conditioners kept the unit very cool in August. Our favorite features were the beautiful location above a side canal next to Santa Croce and the great features in the unit including a kitchen with a larger refrigerator, washing machine, dishwasher, stove, etc. Owners were very reliable. Had trouble climbing the stairs to the top floor in the dark. I am sure there were lights, but I could not figure it out. There is a per person per night tax paid in cash to the owner to pay the City. We would highly recommend staying here and we would stay again. We rented this unit specifically to minimize the walk from Piazzale Roma with our luggage. The location is superb! The unit itself has two split-style air conditioners, which are basically silent - very good quality. Hint: you only need to run them in 'econo' mode - that is plenty of cooling, and saves on electricity usage. The furniture and decorations in this suite are unique, interesting, and very cool. The atmosphere definitely added to the overall quality of our stay. There are two restaurants on the main level of the building - both good, but we preferred the one closest to our entry door. The Pizze Pescatora was incredible! Our hosts were excellent with communication and very helpful. Do make sure to arrange your arrival time well in advance to assist with a smooth occupancy. Our hosts and their helpers were very friendly, courteous, and a pleasure to deal with. I highly recommend this unit! Check in dalle ore 15:00 Check out alle ore 11:00 The check in is free until 8 PM, after that time you have to give 20 euro . After 10 PM the cost is 30 euro. CHECK- IN CLOSES AT MIDNIGHT !